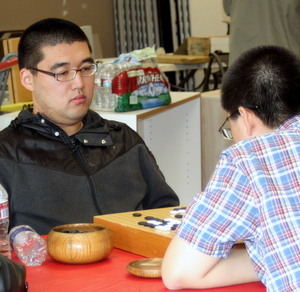 Results: Xuyu Xiang 7D was undefeated to win 1st place in Division A (high dan); Jason Lin 5D won 2nd place. 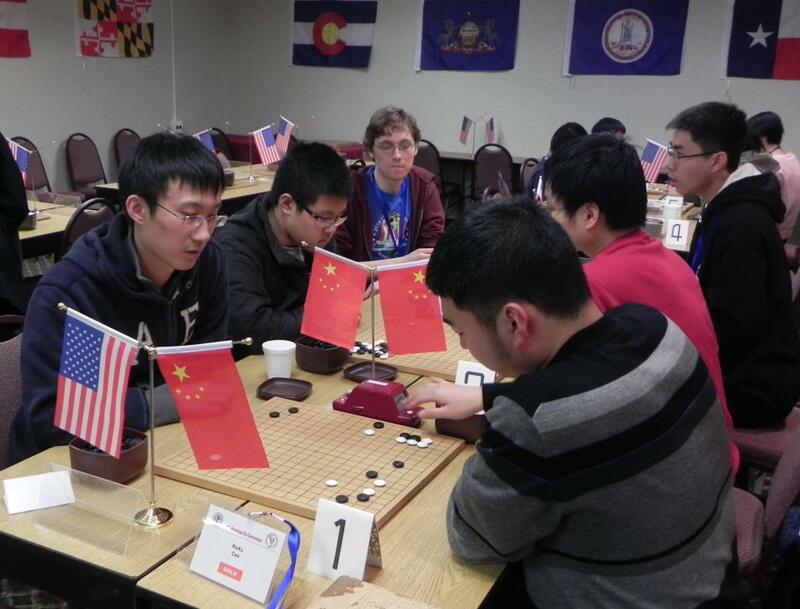 Joshua Simmons 2D — also with straight wins – took 1st place in Division B (low dan & high kyu), Bill Gundberg 1k won 2nd place, Eric Lin 2D and Jeffrey Luo 2k shared 3rd place. Jared Hogrefe 5k, Richard Hardy 5k and Demir Zoroglu 4k won 1st, 2nd and 3rd place respectively in Division C (mid kyu). Shane Edey, Denis Liu and Chiu Ly won 1st, 2nd and 3rd place in Division D (low kyu), respectively. Note that Denis and Chiu are 11-year-old kids. In my last column (The Spirit of Play: “What can I do to improve?” 12/31/2012 EJ) I discussed players who reach moderately high levels of play with little effort, especially regarding problem solving. Since those players often have a big effect on others, I think it would be valuable to delve deeper into the matter. I find it damaging when I hear a strong player say “I got to X-Dan with little study. If you only play games and review you can get to X-Dan like me.” Such cases seem to prove that effort is a waste of time, but they’re really damaging because they discourage players from putting in the necessary work to improve. The reality is that naturally strong players are quite rare. For each player that rather effortlessly reaches a moderately high level of play, there are thousands that do not. The “system” of just playing and reviewing simply doesn’t work for the vast majority of players. And despite their rapid improvement, these players are not really the clear success cases they seem; without proper effort they’re not going to reach the highest level they can achieve. In the end, natural skill doesn’t really matter. It’s just not something you can control. What you can control is the effort and work you put into improving. Natural skill has a limit that effort does not have. We live in an age where one of the most renowned players of all time, Lee Changho 9P, fell extremely short in skill when compared to his teachers and his classmates, but through an immense amount of hard work Lee attained a place at the top of the world. 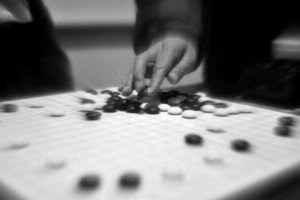 GoGameGuru, the online go “hub” founded in 2010 by Australians David Ormerod, An Younggil 8P and Jingning Xue, started with a bang – literally. Ormerod and Xue were among the 469 passengers flying from Singapore to Sydney when one of the engines exploded four minutes into the flight. The captain was credited with averting what could have been one of the worst air disasters in history. In the wake of this narrow escape, Ormerod reassessed his life priorities, and dedicated himself to bringing go to the West, with the help of his two friends. “More than anything else, Western go needs a steady stream of new players,” Ormerod told the EJ. The result, GoGameGuru (GGG), is a rapidly-expanding nexus of useful information from the ground up, as well as premium services and products for everyone, especially new and intermediate players. A growing collection of essays such as “Thinking Big in Go” and “5 Tips for Dealing with Unexpected Moves” is available, along with problems, game analysis, extensive news coverage of important tournaments and events, and a weekly newsletter claiming more than 5,000 subscribers. GGG has a related Scoop.it account, where visitors and and specifically tailored search algorithms find and suggest related content, and account owners can easily distribute stuff and grow their communities of interest..
more people,” says Ormerod. “If we achieve our goal, the market for go products and services will grow, making a better business environment for everyone.” Last summer, GGG established a partnership with Korea’s BadukTV, making 24/7 go TV available in the US. A subscription also includes access to translated lectures. More recently, GGG has opened an online store, featuring affordable and premium goods. All equipment ships for free, and to support American Go, and GGG will donate 10% of the proceeds from any sale to the AGA (when you use this link). When GGG says “premium,” they’re not kidding – the finest board available will set you back a cool $100,000. Personally, I’m not sure I need to own that one (some more reasonable options also look very nice), but I’d love to play a game on it some time. Use this link to do your shopping and support the AGA at the same time! The AGA has just launched its Pair Go Facebook page. Calling it “a work in progress,” Rachel Small is collecting Pair Go photos from over the years to include on the page, and encourages others to share their photos as well. She also plans to stream photos live from Pair Go events. “Like” it to get Pair Go news, and post on the wall to let others know if you’re looking for a partner. This is the first time that the AGA has made use of online social networking to promote go, and Small notes that it’s appropriate that Pair Go is leading the way, “as it is an inherently social variation of the game.” Photo: Rachel Small with her Panda Net staffer partner at the Pair Go Friendship Match at the Tokyo Metropolitan Edmont Hotel in November 2012; photo by Steve Colburn. “There is a persistent problem with the thinking behind many go articles (The Spirit of Play: “I’m Stuck” 10/29/2012 EJ, for example),” writes Terry Benson. “Everyone eventually gets stuck at some level and can’t get higher. Their game might change, but it doesn’t get better. Whatever rank they are will be their high water mark. That’s go and that’s life. There are limits in our brains which we can test but not break. “So anyone who plays only because they are ‘getting better’ sooner or later will stop playing. 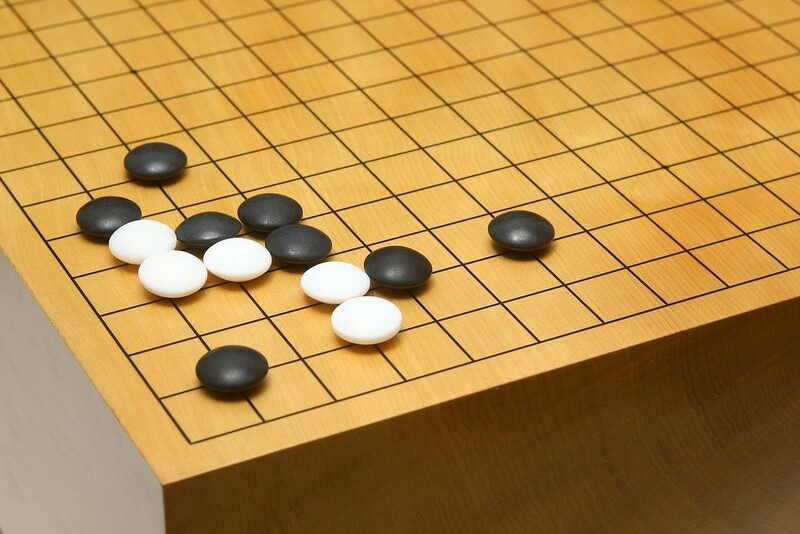 Hopefully, before they give up, they’ll realize that go is a great game with many types of puzzles to solve and a wonderful way to connect to other people. They’ll switch from ‘I have to get better’ to playing for the pure enjoyment of stones, wood, patterns, and the thrills of the contest. “What we need in this country — and indeed in the world — are millions of people playing go the way millions play tennis or golf or run. Most of them will be duffers; 35 handicap golfers, 9-minute milers, and, in go, 25 kyus. And their level of play will seem horrid to ‘serious’ players. But they are playing and they should be encouraged to play simply for the joy of playing. If they are having fun in the confusion of 25 kyu – leave them alone, especially if they’re kids! We know how often a won game gets away, even from stronger players. In some ways the game is even more fun at 25 kyu because literally anything can happen. 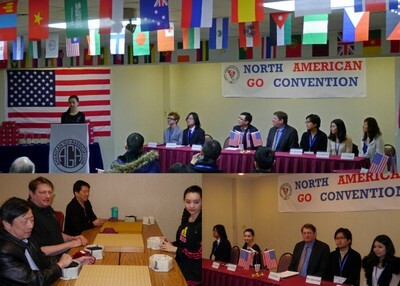 Benson, a 1-dan, has been playing go for 52 years and has served as president of the American Go Association, Managing Editor of the American Go Journal and is currently President of the American Go Foundation. 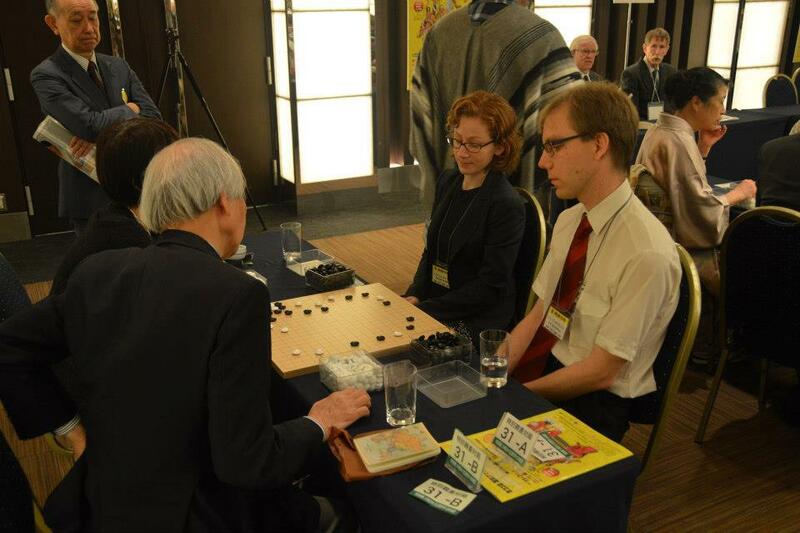 He directed the video/webcast of the International Go Symposium 2012, where he gave a talk on promotion of the game. 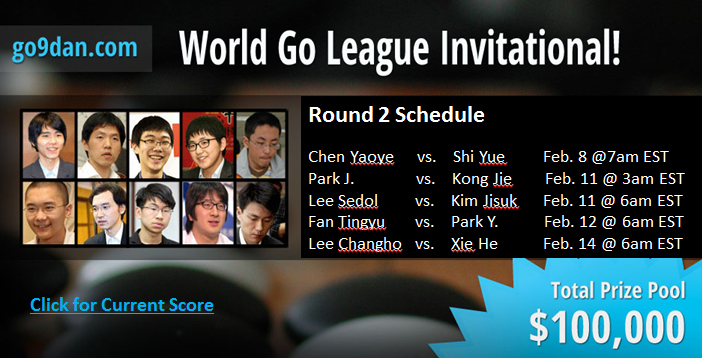 The World Go League Invitational (New Go Server Launches With 10 Top Pros in $100,000 Invitational 12/15/2012 EJ) is underway. 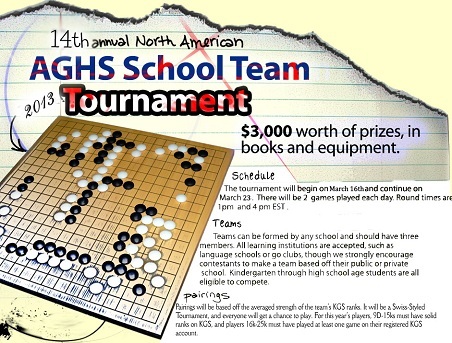 Sponsored by new go server go9dan.com, the contest seeks to determine the strongest go player in the world in a battle between the top five Korean pros and the top five Chinese pros. The World Pro Go League, the first quarterly league, commenced the last week of January and will end in March or April. Click here to see the the latest results and playing schedule and here for game records. To read comments see go9dan.com’s Facebook page. Here are the results in the first five games; the first player is white and the winner is in bold: 1. Lee Sedol-Chen Yaoye; 2. Shi Yue-Lee Changho; 3. Park Junghwan-Xie He (note from go9dan.com: the “future authority of Korean Go” Park Junghwan won by time against one of the super-powers of China Xie He at move 84. We confirmed with Xie that it was not a technical problem. “The opening joseki feels good for white. After W’s move at 60, the game looks difficult for black.” said Lee Sedol); 4. Kong Jie-Park Younghoon; 5. Fan Tingyu-Kim Jisuk.